I never thought I’d have 4 opening receptions in one week. All group shows. And, one in Norway. But, I’m impressed still. 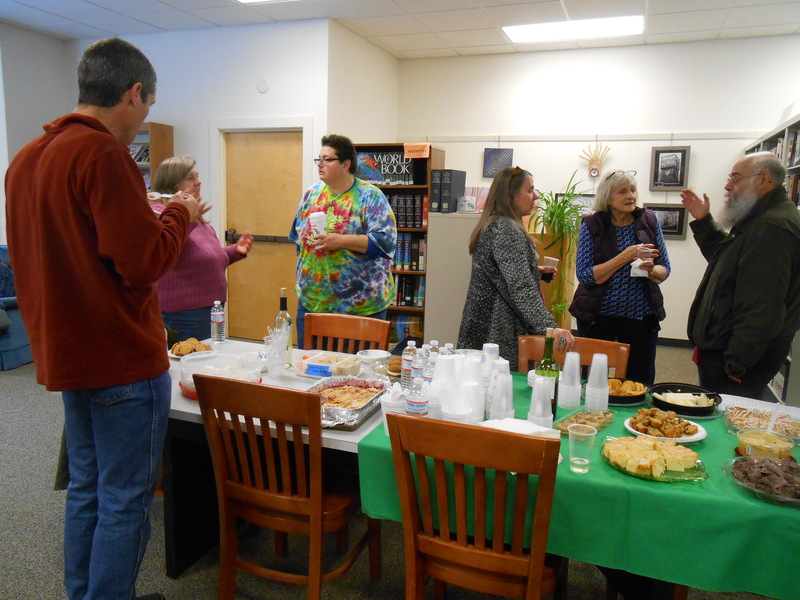 Tuesday night, the show that I coordinate for the Berwick Art Association opened at the Berwick Public Library, Berwick, Maine. The show is 46 pieces strong, and includes 20 artists from around the region including: Beth Wittenberg, Christine Kfoury, Anne Vaughan, Bob Farrell, Jean Coughlin, Erika Carty, Rita Fuller, Christy Bruna, Michael Bramlett, Laura Tuininga, Gloria Houlne, Eric Pomorski, Roseann Meserve, Daryl-Ann Dartt Hurst, Jane Lissner, Lee Copp, Gene Galipeau, Tom Gillis, Ruth Bleau, Bruce Bacon. Turn-out was light, but we had a good time! And, it is a great show. It will be up through March 27. Thursday, I was part of an opening in Moss, Norway. I am not going to import Facebook or Twitter images here. It was a benefit, and I was happy to donate a piece-and it’s cool to say I have been shown in Norway! Friday, was crazy. I am done with openings…until next Friday. The Gallery at 100 Market Street is an important place for me to show for a spectrum of reasons. And, this was my 5th appearance on these walls. I have two small pieces on the 4th floor that I didn’t shoot for the blog. This was not my most impressive appearance, but there are more to come. The show was filled with gems, as usual. I will have to go back to shoot more, because what I shot last night was awful. The BUOY in Kittery, Maine hosts an aRtPM Challenge annually where the only restriction for inclusion to this show is it has to have been created within the month of February. I included “Muzykzny” last year, even though the sides were still slightly wet. This year, a piece called “Valentine” graces their walls. She’s the faceless watercolor to the bottom left. I saw a ton of other people’s art today. 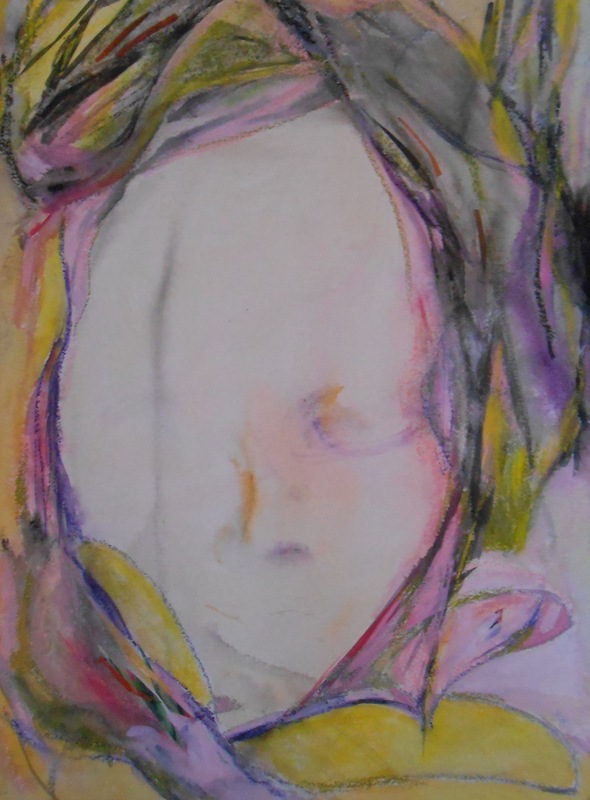 “Valentine”, 2015 (c) Daryl-Ann Dartt Hurst, mixed media on handmade paper. The Portrait series, or as they have come to be called, “The Personal Storms”, have evolved onto handmade paper. There are also bits of collage in this piece. It will be on display at BUOY, Kittery, Maine through April. The opening reception for the show is this Friday, March 13, from 6-? 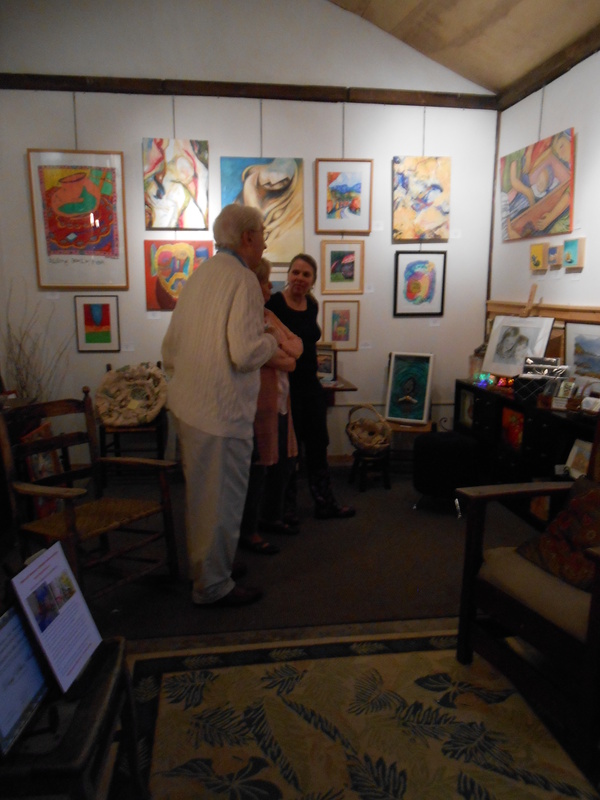 On to the Kittery Art Association, since I had a meeting of the Seacoast Moderns to attend there. A drastic difference from 100 Market, not so much in quality of execution, but in depth. “Color Palette” offers a great deal of eye-candy. And, much like the “candy food group” is to the body, there is real no nutritional value to the brain in this show. This is another venue where I am a member and regularly show, as well. I joined this art association four years ago to have an outlet, and for many of us, it does provide that in a lovely two-story building on Kittery Point. I couldn’t make the drop-off for this show, since I was hanging the Berwick Art Association show at Sole City, at the same time. There are some very technically skillful members, which was also my “draw”. And, it is not nearly as expensive to be a member as the Ogunquit Art Association or the New Hampshire Art Association-though, they look better on the resume since you are juried into them. KAA has no jury process. 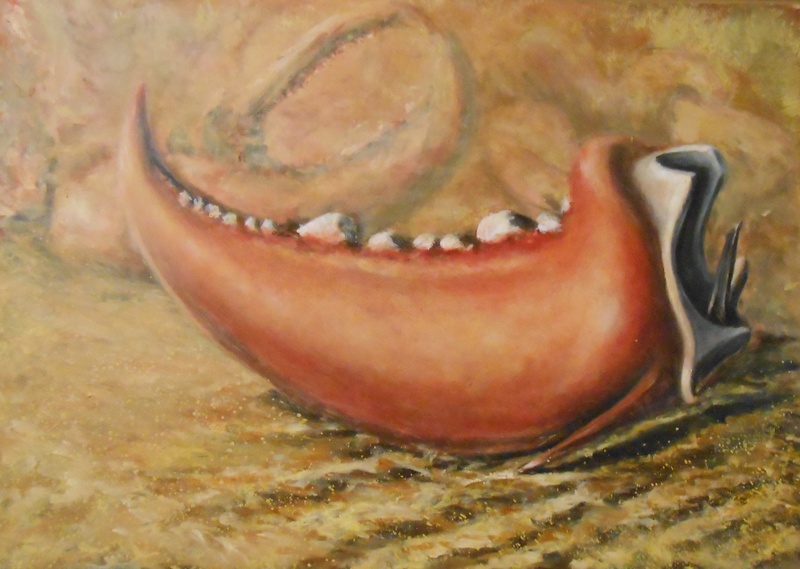 “Kayax” (c)Jennifer Chamberlain, oil on canvas. 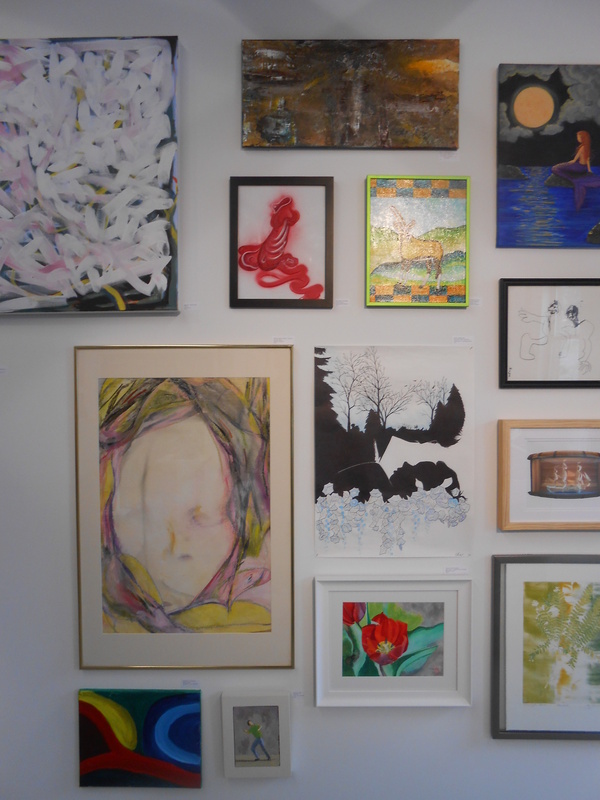 As with the Gallery at 100 Market Street, the KAA shows are always very well-hung. 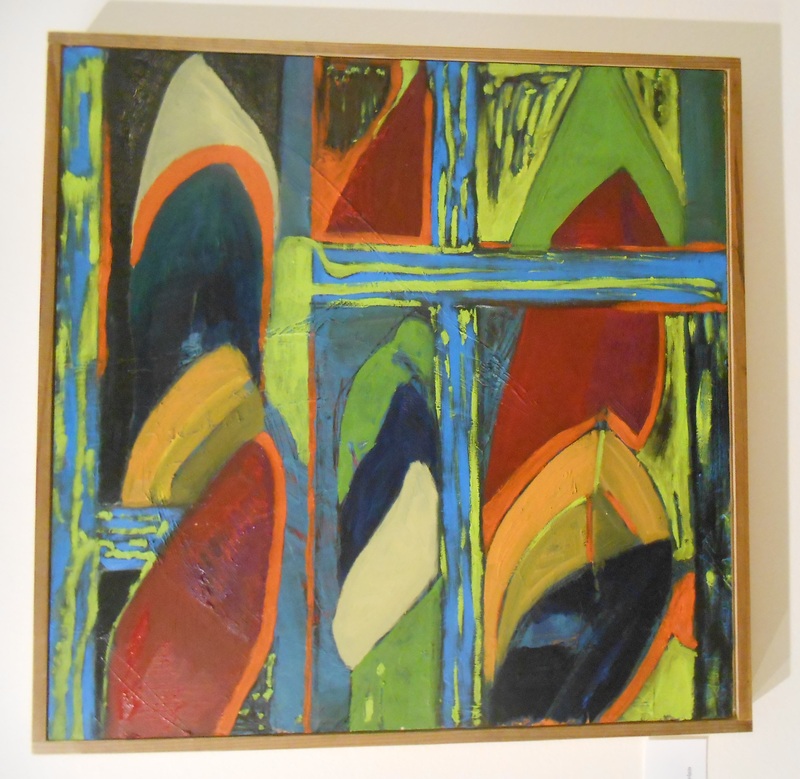 Judith Bryant has a remarkable eye for making very diverse work, in medium, theme and quality, work together. And, she has no prior knowledge what she will have to work with until it arrives! Not as challenging or thought-provoking as the Portsmouth show, but definitely worth the drive to Kittery Point his week-end. This whole corridor of southeastern Maine and New Hampshire, including the Berwicks, York and Kittery in Maine, and Dover, Somersworth, Rollinsford, and Rochester in New Hampshire have literally come alive since I moved back to the area in 2005. I have become very involved in two of the art associations, and the I am Show Coordinator for one, as well as on the curatorial board of the Rochester Museum of Fine Art. The area has not kept up with gallery creation, and the economy still doesn’t support that kind of a venture without a “safety net”, but there are many great supportive venues like the libraries in the area. I have shown five times at the Rochester Library in the new wing, where Peggy Trout arranges monthly shows with local artists and art groups. The old wing, or the Carnegie wing, displays some of the permanent collection of the Rochester Museum of Fine Art on the main floor. The Carnegie Gallery on the 2nd floor, is where the rotating and borrowed exhibits are hung. Beth Wittenberg is on display on the main floor. Beth is a very active member of the Berwick Art Association and also a member of Blackbird Studio and Gallery, so we have shared lots of walls together. Beth and I also share a very special connection with art-making, where it seems neither of us have to rely on a muse, inspiration or even a good cup of coffee to need to make art. What I love about Beth’s work is there is always more than meets the eye. In these pieces from 2013 and 2014, she works very splattered and loose watercolor abstracts into pen-ink fantasy characters, that have color. As an abstract painter, I get lost in looking at the paint below the ink, and then float back to the finished work, appreciating it on multiple levels. 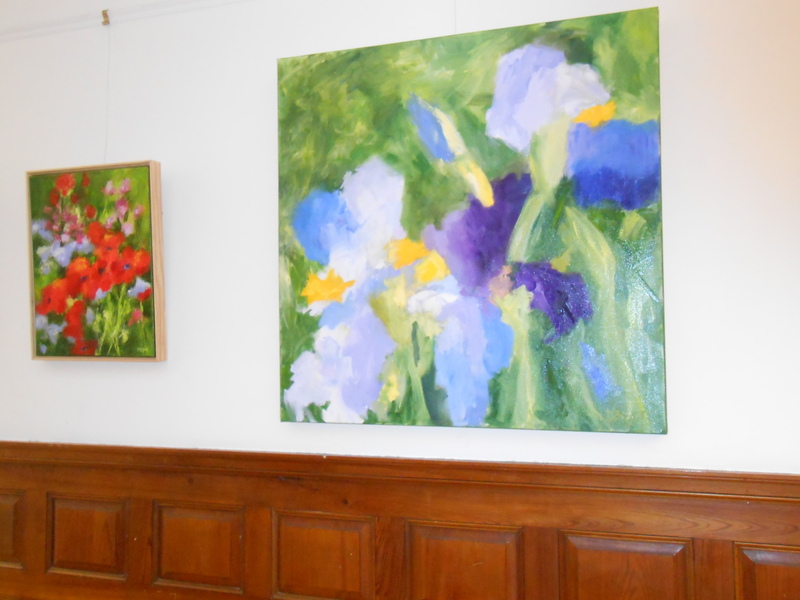 Upstairs, in the Carnegie Gallery are a collection of Dawn Boyer’s oils. Until I brush on my critiquing skills, I will respond as I have to Beth’s-as it relates to my work. Though she is responding to florals, I am looking beyond that again at paint and color. The brush work is solid and experienced. There isn’t hesitation. Nor, is there any immaturity in the palette-it is also self-assured. Both of these shows will be up through the end of the month. And, I will probably need to expand the corridor as I described it because I have been invited to show at the Gafney Library in Sanbornville, New Hampshire next month. Another 20 miles north of here. I am now contracted to teach 3 adult education classes. I have on occasion sold classes without good examples for advertising. So, this week I played with doing a self-portrait in pastel. I know how, just haven’t in…probably 20 years. 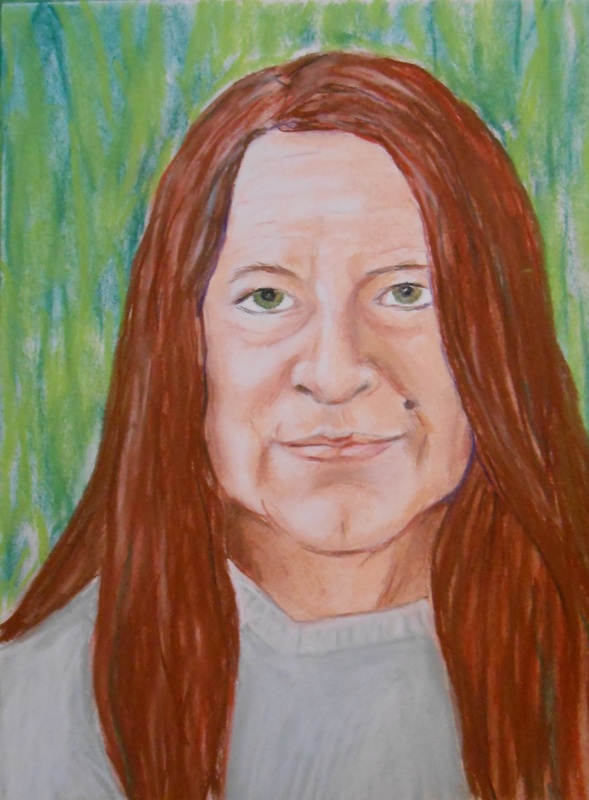 The first wasn’t a failure-actually a good drawing-but the face was me at 19. I finished this today. More like it. 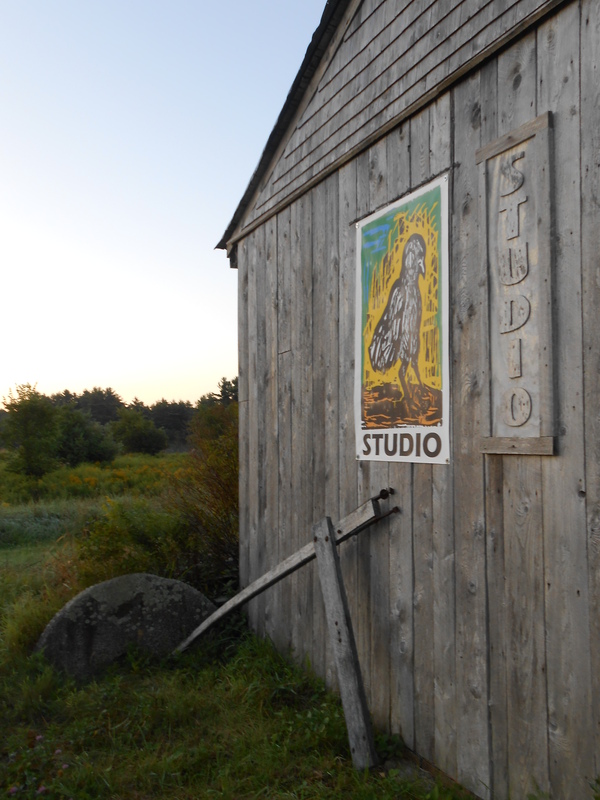 I will be teaching several classes in the southern Maine and New Hampshire area, from watercolor, plein air, mixed media, and pastel portraits. Jean Coughlin discusses Blackbird Studios with a woman interested in joining the collaborative. I had two show openings this week-end. 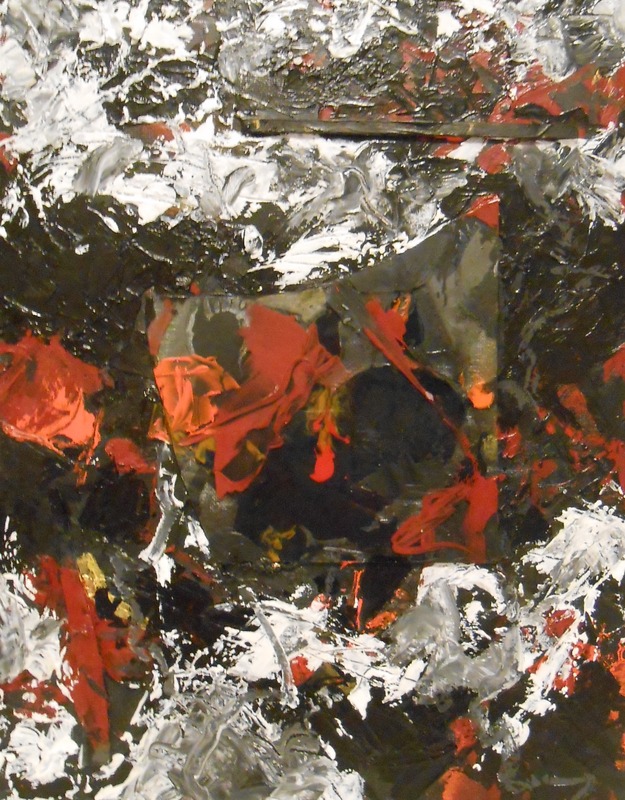 The one at Edward Jones in Kittery, Maine is a part of a satellite program of the KAA, and I have 6 pieces there that will hang until April, 2015. https://www.facebook.com/kitteryartassociation?fref=photo for more information-and there is a picture of three of the artists (including me) and the curator, Judy Bryant. “Fall to Earth” is the last regular show at Blackbird, and runs through December 7. This collective of 15 artists produces in my estimation, the best work in the area. There is no lack of variety, ingenuity, or experimentation. The work is on the grounds as well as inside. I have 9 framed pieces and around 30 unframed pieces as well as painted light switch plates and beaded handbags available for purchase. 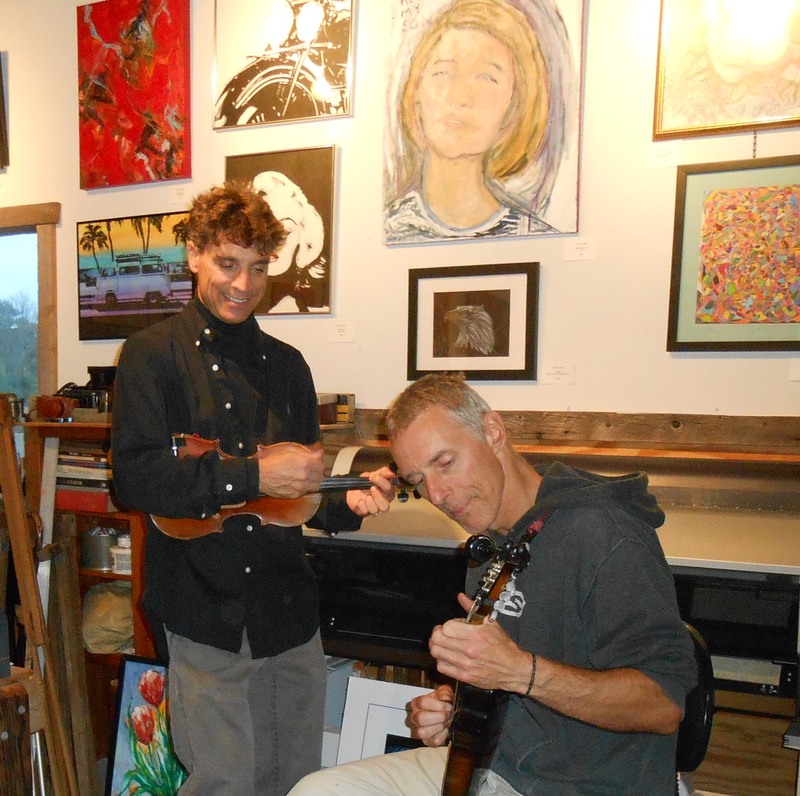 Our opening receptions have also included live music. Since we had a brief period of rain yesterday, the Rogue Town Managers moved inside. When the rain stopped, they moved back outside to entertain those seated under two tents. The Rogue Town Managers during the downpour. The red canvas in the upper left is mine. The gallery hours are 11-6, Wednesday-Sunday. You might also catch prints being pulled off the flatbed press, an installation being mapped out, an artist being interviewed for MODspoke, a local e-zine, as well. 387 Somersworth Rd. (Rte. 9), North Berwick, Maine. Coming up: September Song opening reception at Blackbird Studio & Gallery, 387 Somerswoth Road (Rte. 9), North Berwick, Maine on September 6th, from 3-7 PM. The Seacoast Moderns will host the opening for “Igniting the Modern Muse” (our gallery group show) on September 28th, from 4-6 PM at the Kittery Art Association, 8 Coleman Avenue, Kittery Point, Maine . I am planning to teach a rendering in watercolor workshop/how to layer, working wet-on-wet, to develop shadows and richness in color at Blackbird on Tuesday, September 16th and Tuesday, September 23rd, from 6-8 PM- two-2 hour classes, $45 per person, materials included. (Contact me @artinsmallplaces@gmail.com for more information) And today: marketing, marketing and more marketing. Etsy, Pinterest, FineArtAmerica, society6, Houzz, my website and my blog….for starters. 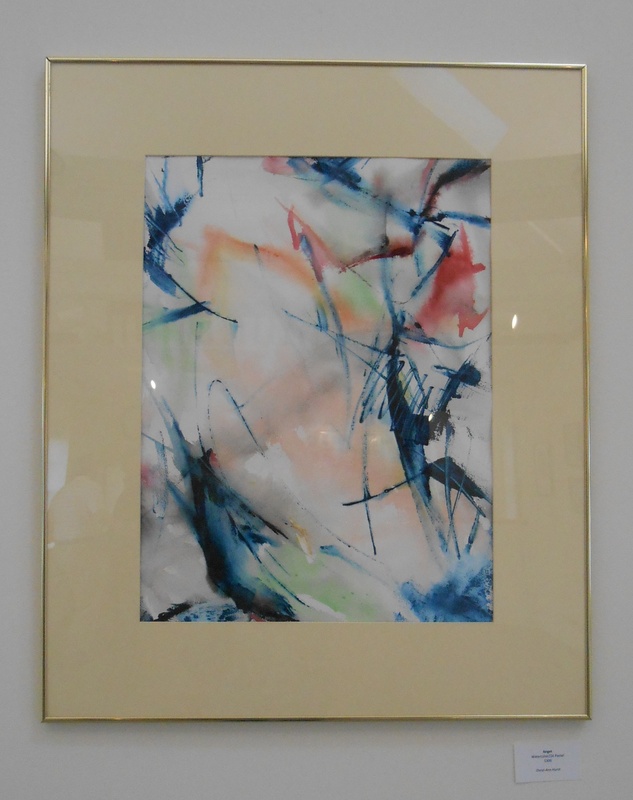 I included two very new larger watercolors in this show that have been very well-received. I wish I had a dollar for every time I said “thank you” last night for praise! Feels great! “Anget”, 2014, (c)Daryl-Ann Dartt Hurst. Watercolor, oil pastel on paper. 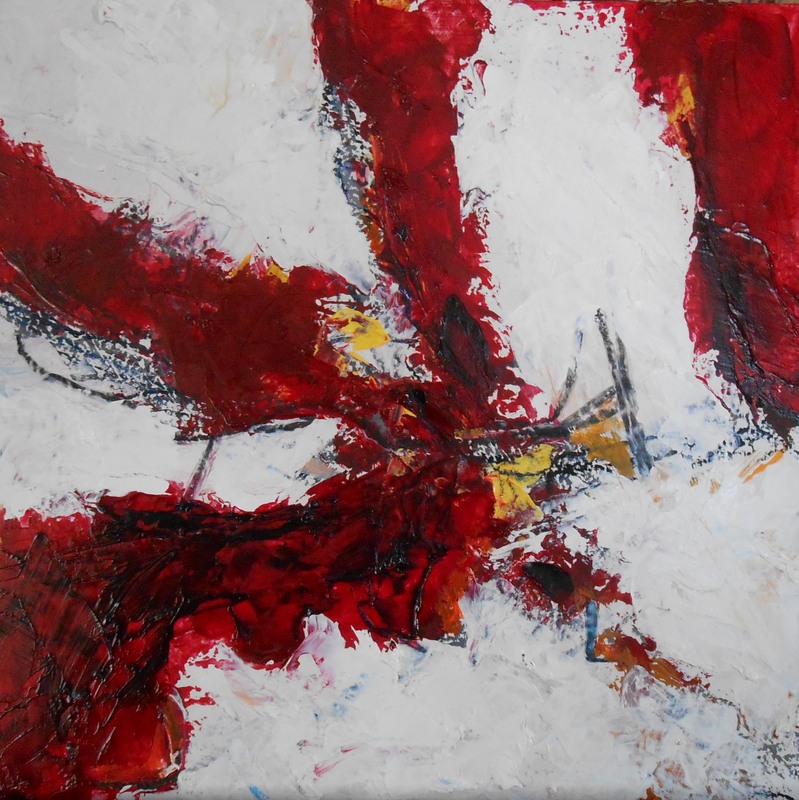 34″h x 28″w. 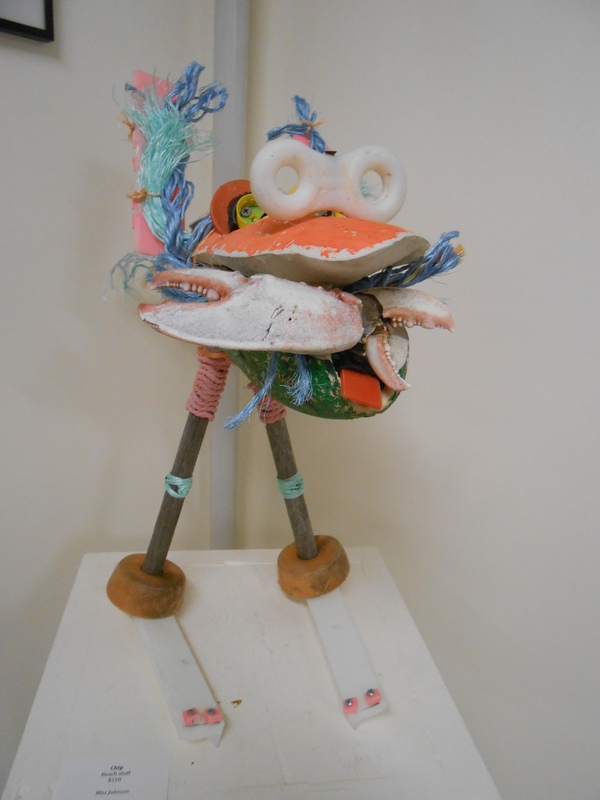 This is the piece that I hope will be used for the invitation for the upcoming KAA show called “Recycle, Refurbish, Reclaim”, which opens March 27th and runs through April 20th. Lots up, and more coming up! This is at the Kittery Art Association. Now.